This medicine outlet was started in 2012 and is being operated by the hospital staff. It is funded by Govt. 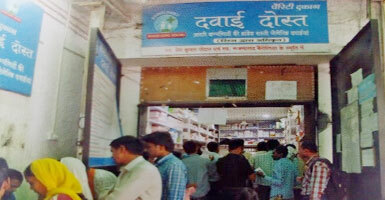 of Jharkhand and offers medicines at dicounted prices. Prescription as well as Over The Counter Drugs are available.It is open for 6 days a week, from 9:00AM to 1:00PM and then from 3:00PM to 5:00PM. The outlet is under the supervision of Medical Officer and the Director. Functioning since Sept. 2015, Dawai Dost has been a savior for thousands of paitents by providing medicines at highly subsidised rates. Rub by the Poddar and Bairoliya Trust and managed by RIMS, the shop presently offers approximately 1200 variety of medicines and surgicals. It's a Not for Profit organisation. It is open from 8:00AM to 11:00PM and caters to atleast 700 patients on a daily basis. the shop is managed by 18 staffs including 6 pharmacists, who work in shifts. Medicines are available only to those having a valid prescription from RIMS.